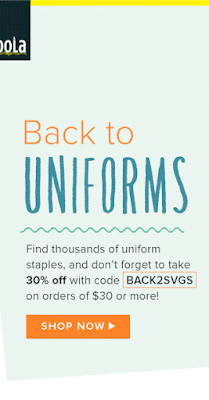 Savvy Spending: Schoola: Uniforms starting at $5! Plus free $30 to shop for new members! Schoola: Uniforms starting at $5! Plus free $30 to shop for new members! If your child needs a uniform for school, consider checking out the gently used uniforms at Schoola! 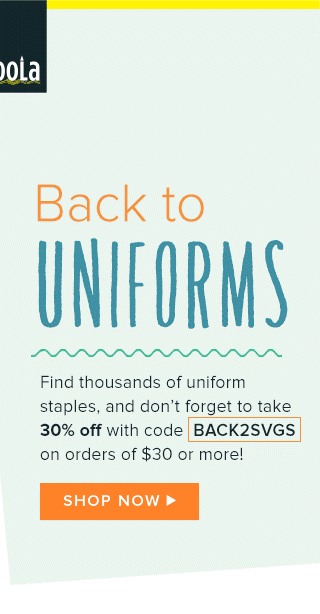 They start at just $5 and if you spend $30 at Schoola, you can save 30% off your total with code BACK2SVGS. Plus, don't forget that new member get a free credit of $30 when they join!! Just GO HERE to sign up and get a $20 credit! To get another $10 credit, after signing up, go here to create a "custom collection" (it takes just a few seconds) and you'll get another $10 credit-- and yes, these can be used together!! So, NEW MEMBERS can start off with $30 in free credit to use, so you'll get gently used clothing (for kids and adults) for FREE!!!! !